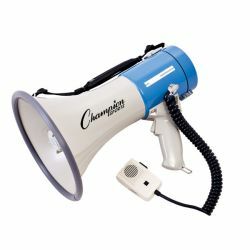 The Champion Sports Recordable Megaphone will really get their attention! This 20 watt megaphone has an 800 yard range, and features a 60 second recordable message that will repeat—making it essential for giving instructions, directions, or emergency messages. You'll never have to worry about being heard!